The sam® Sport is a FDA-approved portable ultrasound therapy unit that reduces the pain associated with tendon, ligament or muscle injuries by using ultrasound waves. Using ultrasound therapy is one of the most common treatments used in the management of soft tissue or sports-related injuries. sam® Sport provides ultrasound waves that penetrate 5 cm into the tissue. This increases circulation, oxygen and nutrient delivery, and the removal of waste products from the site of a musculoskeletal injury. The portable ultrasound unit makes it easy to use, especially when on the go. sam® Sport allows the patient to self-administer ultrasound therapy anytime throughout their busy day – saving time for both the health care provider and the patient. It is recommended that new patients begin wearing the ultrasound unit for one hour the first day of use. The next day, increase the time by one hour. Continue on this regimen until you reach four hours total per day. It is suggested to begin usage of sam® Sport in this manner since every individual is different. As you get used to the device, it is recommended you wear it four hours a day, for five days per week. sam® Sport is most commonly prescribed for those with acute and chronic tendinopathies; muscle strain or spasms; or pain associated with osteoarthritis of the knee. sam® Sport can be used to treat injured sites throughout the body such as the tendons of the elbow, Achilles, patella, shoulder and bicep; and muscles including the trapezius, hamstring, and quadriceps. Among athletes, tendon and muscle injuries account for 40%-60% of sports-related injuries. When tendons are injured, irritation and inflammation of the tendon may result causing tendinitis or tendinosis. Among athletes, these injuries are commonly referred to as swimmer’s shoulder, golfer’s or tennis elbow, jumper’s or runner’s knee, and pitcher’s shoulder. Using the sam® Sport portable ultrasound unit, you’ll receive an effective and speedy recovery, whether you’re an athlete or just suffering from acute muscle pain. sam® Sport is a prescription device covered by most professional sports and collegiate insurance companies indicated for the treatment of muscle pain, muscle spasms, joint contractures, and the increase of local circulation. It is most commonly prescribed for tendinopathies, muscle strain, spasms and bruises, shoulder injuries and osteoarthritis pain of the knee. 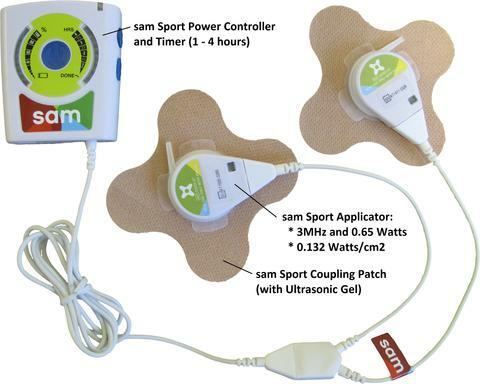 Reducing muscle pain is easy with sam® Sport, as it can deliver ultrasound waves with one or two applicators, whether on the go or in the comfort of your own home. Forget what you know about ultrasound therapy! Unlike traditional, in-office ultrasound and other treatment modalities, the sam® Sport portable ultrasound unit delivers Sustained Acoustic Medicine – a self-applied bioregenerative therapy that can be used daily. The benefits to ultrasound therapy are listed below. sam® Sport stimulates the body’s natural repair process through the sustained delivery of low intensity ultrasound waves. Using sam® Sport is as easy as 1, 2, 3. Watch this video to learn more about how sam® Sport’s ultrasound waves deliver sustained action for a faster recovery. How does sam® Sport work? 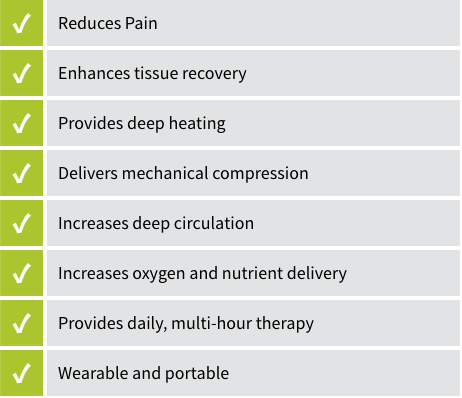 sam® Sport is a bio-regenerative medical device that delivers Sustained Acoustic Medicine, providing 1.3 W of low-intensity (132 mW/cm2) ultrasound energy at 3MHz frequency to accelerate biological healing processes and reduce pain. Through the sustained delivery of low intensity acoustic waves, sam® Sport stimulates the body’s natural repair process. For more information, please view this video which further explains the mechanism of action. What are the typical injuries that are treated by sam® Sport? sam® Sport is most commonly prescribed for acute and chronic tendinopathies; muscle strain or spasms; or pain associated with osteoarthritis of the knee. sam® Sport can be used to treat injured sites throughout the body such as the tendons of the elbow, Achilles, patella, shoulder and bicep; and muscles including the trapezius, hamstring, and quadriceps. 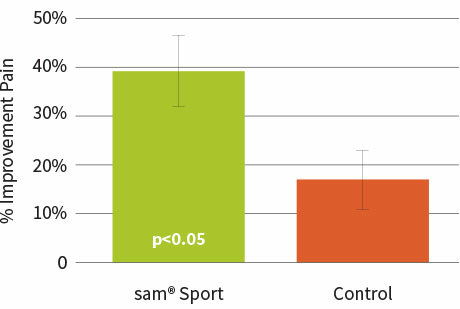 Can sam® Sport be used to strengthen tissues to prevent injuries/recurrence of injuries? 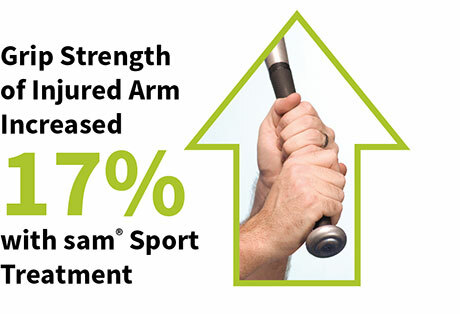 Yes, in a clinical study of subjects with elbow tendinosis, treatment with sam® Sport increased the grip strength of the injured arm by 17%. Subjects in this study also reported a 70% decrease in pain on a 0-10 scale over the six week study. Whether sam® Sport can effectively prevent future injuries has not been studied in a clinical trial. How is sam® Sport different from traditional therapeutic ultrasound? Traditional therapeutic ultrasound requires active administration by a trained professional using benchtop or cart-mounted equipment, thereby limiting treatments to only a few times per week for 15 minutes or less. Research has shown that given correct dosing, which includes treatment frequency, intensity and duration, ultrasound is effective in treating soft tissue injuries. Until now, therapeutic ultrasound treatments have been limited to the amount of time a trained professional actively applies therapy. sam® Sport allows the patient to self-administer the therapy anytime throughout their busy day – saving time for both the health care provider and the patient. 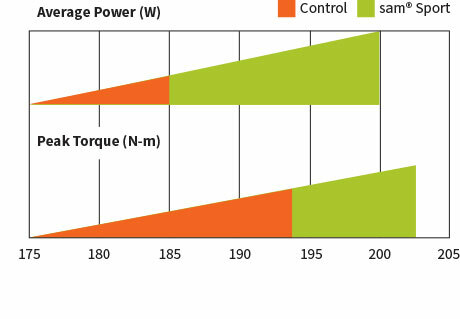 How is sam® Sport different from TENS? Transcutaneous Electrical Nerve Stimulation, otherwise known as TENS, uses electrical currents to control pain by stimulating nerves and blocking the pain signals that would otherwise be sent to the brain. While TENS and sam® Sport have proven successful in clinical studies for relieving pain, only sam® Sport and its ultrasonic energy aid in the recovery process by increasing circulation, and accelerating the natural healing cascades through mechanical stimulation. How many hours do I wear the sam® Sport device per day? If unfamiliar with using therapeutic ultrasound, it is recommended that patients begin wearing the device for one hour the first day. The next day, increase the time by one hour. Continue on this regimen until you reach four hours total per day. It is suggested to begin usage of sam® Sport in this manner since every individual has a slightly different anatomy and physiology (e.g. such as muscle mass, skin sensitivity, and core body temperature) that can affect your experience. How many weeks do I typically use sam® Sport? sam® Sport should be used for four hours each day for at least five days per week to receive the recommended dose of ultrasound therapy. On average, patients with an acute injury should expect to wear the device for two to six weeks. Patients with chronic injuries may require eight to 12 weeks of sam® Sport usage to receive its full benefits. Patients may need to continue wearing the device after the recommended number of weeks, on an as needed or preventative basis. Can sam® Sport be used to treat osteoarthritis? sam® Sport has effectively been shown to reduce pain due to osteoarthritis. As part of a randomized sham-controlled study funded by the National Institutes of Health, subjects treated with an active device (n=28) who experienced moderate to severe pain at baseline reported a 40% decrease in pain measured on a zero to 10 numeric rating scale over a six-week treatment period. While sam® has proven effective in reducing pain associated with osteoarthritis, it is clinically unknown if it actually impacts the disease progression. However, it has been shown in animal studies that long-term administration of therapeutic ultrasound can diminish the severity of knee osteoarthritis. 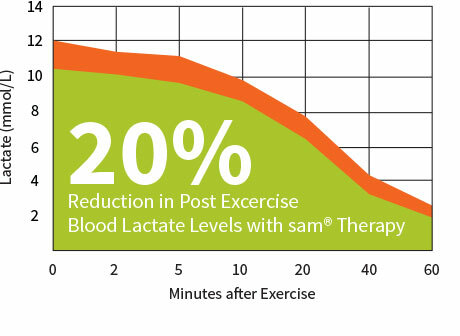 Can sam® Sport be used to accelerate post-operative recovery? Yes, sam® Sport can be used in your recovery process after a surgery under the direction of your health care provider. sam® Sport should not be used over an open wound, inflamed skin, or an implanted medical device. These factors should be considered in determining when and how to implement sam® Sport into your recovery process. What are the possible side effects? How common are they really? The most common side effect is skin sensitivity resulting from two possibilities: improper coupling of the applicator to the skin, or skin irritation from the prolonged use of the patch. These side effects are avoidable by ensuring that adequate sam® coupling gel is applied to the applicator before it is placed on the skin, and by avoiding placement of the applicator over a bony part of the body. If you experience skin irritation from using the patch, it is recommended that the placement of the adhesive part of the patch be rotated (approximately 45°) each day. If you have significant body hair in the area of application it is recommended that you shave the area before using sam® Sport. In a human factors evaluation conducted on 20 subjects who used the device three times each, 0% of subjects reported an adverse event or skin damage from treatment. Repeated use of the patch caused discomfort or irritation of the skin in only 3% of cases. Will sam® Sport interact negatively with other therapies (e.g. massage, or physical therapy) or medications? No, sam® Sport should not negatively impact any physical therapy, athletic training, or massage therapies. sam® Sport is designed as a drug-free alternative to treating pain, however, it should not interact with any current medications you may be taking. Please reference Contraindications and Warnings, which further discuss specific cases in which the device should not be used. For example, sam® Sport should not be used over an implanted medical device, or cardiac pacemakers. Precautions should be taken in individuals with potential acute infections, sepsis, peripheral artery disease, or deep vein thrombosis. What do I do when the device goes into sam® Sensing Mode? You do not need to do anything. sam® Sport is designed to work with the human body and maximize the safe and effective delivery of sustained acoustic medicine. When the applicators go into sam® Sensing Mode, a red LED will replace the normal blue LED light. The device will continuously monitor the status and the blue lights will return when ideal operating conditions are sensed. However, you should check that the unit is not covered by thick insulating material such as coats, blankets or a sports wrap, as this may cause the sam® to disable and remain disabled. Do not turn the device power “off” and “on” if the unit goes into sam® Sensing Mode. When should I use one or two applicators? The decision to use one or two applicators is dependent on the size and anatomical area of treatment. For example, large regions, such as back treatment, could benefit from two applicators. However, smaller treatment areas, such as the forearm, may only require one applicator. Your health care provider will instruct you on whether to apply one or two applicators based on your injury. How do I configure sam® Sport for use with one applicator? With two? To use sam® Sport with one applicator, connect the applicator directly to the wire from the Power Controller. You should not be using a sam® Sport Y-adapter in this configuration. For use with two applicators, first connect the wire from the power controller to the female connection on the sam® Sport Y-adapter. Then, connect each applicator to the two male connections on the sam® Sport Y-adapter. Patients with tendinosis of the elbow or Achilles, treated daily with sam® Sport for four hours per day, experienced a 70% reduction in pain after six weeks of treatment. Grip strength also increased by 17% in patients with elbow tendinosis, suggesting recovery of the injured tendon. 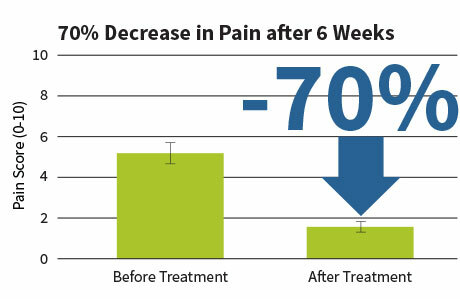 Treatment of patients with moderate-to-severe pain due to osteoarthritis of the knee with sam® Sport (four hours per day, daily for six weeks) resulted in a 39% reduction in pain levels, compared to only a 17% decrease in pain in the control group.